Design ideas for a small traditional patio in London with brick paving. 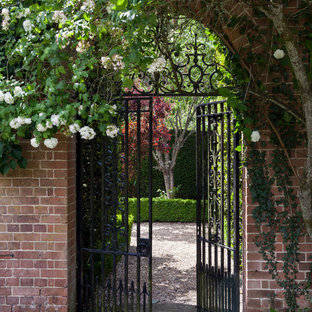 Inspiration for a traditional fully shaded garden in Sussex with a garden path. Design ideas for a traditional front formal partial sun garden for summer in London with natural stone paving. 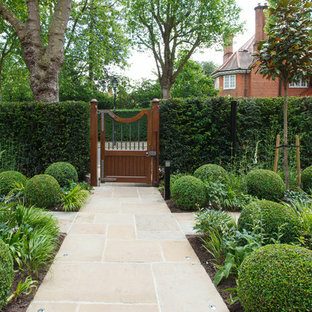 Design ideas for a classic partial sun garden in Manchester with a garden path and natural stone paving. 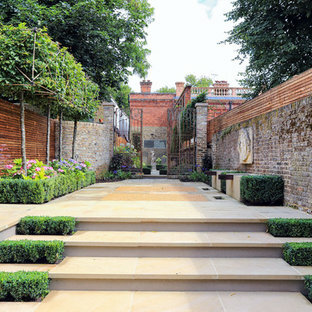 Photo of a traditional patio in London with natural stone paving. 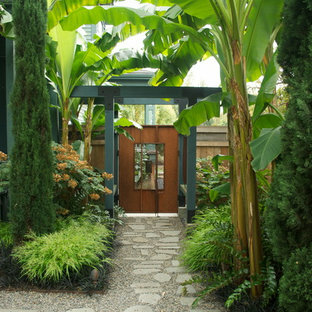 This is an example of a traditional partial sun garden in San Francisco with a garden path and natural stone paving. 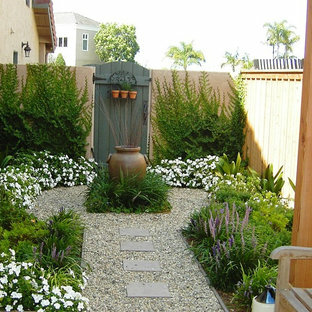 Small mediterranean side formal garden in San Diego. 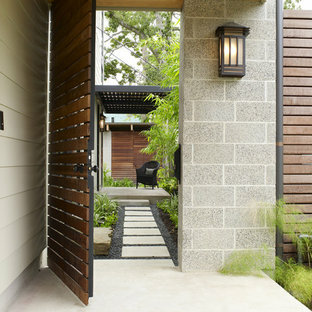 Inspiration for a world-inspired garden in Houston with concrete paving. 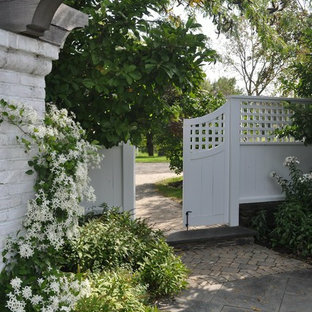 Traditional garden in Chicago with natural stone paving. 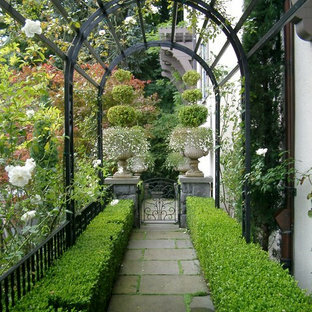 Inspiration for a traditional partial sun garden in Portland with a garden path. Photo of a contemporary back garden in Portland with natural stone paving. Contemporary side garden in Seattle. 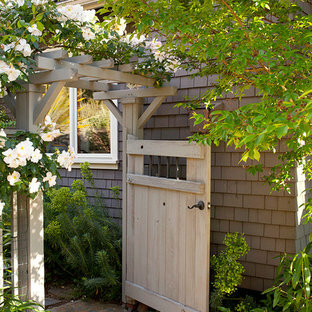 Inspiration for a traditional back garden in Dallas with natural stone paving. Concrete driveway with grass strip up the middle leading to the double curved cedar gates into the rear yard. 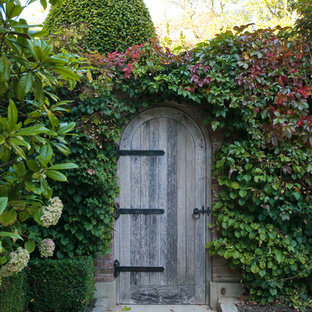 Inspiration for a large traditional side driveway garden in Toronto. By Dear Garden Associates, Inc.
A purple hyacinth bean vine (Lablab purpureus) drapes one of the gateways. Planted as an annual in Pennsylvania it will grow up to 20’ in a season, producing purple/pink flowers and fabulous purple pods all summer long. The leaves, flowers and pods look beautiful both clambering on the fence and in mixed bouquets. An axis through the hillside layers with korean grass steps above. Photo of a medium sized modern sloped xeriscape full sun garden for autumn in Los Angeles with concrete paving.